And, in the blink of an eye, the weekend was over. For the first time in months we slept in late Saturday morning – didn’t get out of bed until almost eight o’clock! What a couple of hedonists we can be! After we’d cleared the cobwebs from our heads with a couple cups of coffee, we went to Crema Cafe, a local coffee house, for brunch and some more coffee. I’d never been before – well, years ago I had, but it had a different name then and was a lot smaller. Whoever is running the place now managed to buy up the place next door, knock out the wall and make a very cozy little cafe that serves quite a tasty fungus scramble. After we got home, I went into brewing mode: Looked up a recipe on the web for a basic red ale, made a list, and hit the road to Brew & Grow, the local brewing supplies store. And, because it’s a natural law that all the trips I make for supplies have to come in twos, I made another trip back about a half-hour later when I was unpacking my supplies and realized I’d forgotten to buy the yeast. Can’t make beer without yeast. I boiled up the brew on the patio with a beer in hand while B pulled weeds in her garden. Her hobby: Pulling weeds in the hot sun. My hobby: Drinking beer. That, in a nutshell, is why I don’t garden. But I help her garden from time to time. Yesterday, we were both tearing down the chicken wire fence, digging trenches between the fence posts and tacking up fresh, new fencing, made of galvanized hardware cloth this time. We meant to buy galvanized chicken wire last time, but we must not have been paying attention on one of the trips we made to the store because about half of it rusted away, leaving gaping holes big enough for black bears to amble through. I double- and triple-checked the labels on the hardware cloth to make sure it was all galvanized, so rust shouldn’t be a problem this time. Finally, yesterday afternoon I grilled burgers. And that was the weekend. I had a late lunch today and needed a drink that I chug along with the calzone I was going to wolf down before I scampered back to the work shop to play with power tools some more. When I opened the fridge this bottle of Rolling Rock was in the front and I thought, Why not? Youre probably thinking of plenty of reasons not to, but I was in a hurry, as I said. I also needed a non-alcoholic drink, and Rolling Rock is so close to non-alcoholic as to make no difference. 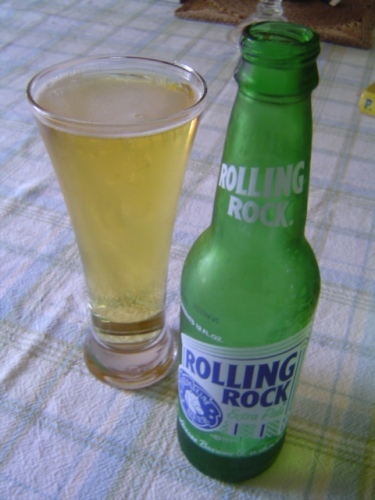 Finally, I cant remember the last time I drank a Rolling Rock. It was so long ago that I couldnt recall what it tasted like, so it must not have been all that bad. I popped it open and poured. And you know what? Its not all that bad. I wouldnt say its great, but its actually a pretty good beer to drink ice-cold on a hot summer day after muscling power tools around all morning. Id even call it refreshing. I wouldnt pay more than four bits for a bottle, but I think thats about what they charge for it, so Im not worried. In case youre wondering why we even have Rolling Rock in our house: My Darling B has slugs. Thats not code for something: Theyre in her garden, eating her vegetables. To get rid of slugs, you press a saucer into a little dimple you make in the ground, so the lip is even with or below ground level, then pour a little beer into it. Slugs love beer, and when the smell reaches them they come from all around to drink it. Trouble is, they cant swim, so when they wade in to drink the beer, they drown. If you thought drinking was detrimental to people, thats nothing compared to what it does to slugs. One drink – Good-bye! 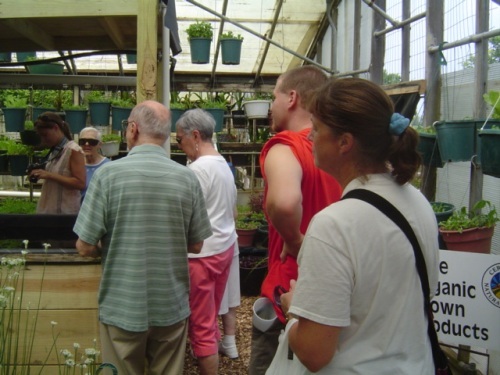 Yesterday we all piled into the car and drove to McGovern Park, a north Milwaukee neighborhood near Glendale, where we visited Growing Power, an urban farm. Right in the middle of an urban neighborhood, with houses and apartment blocks all around, these guys were growing veggies and raising fish, chickens, goats and turkeys, and selling all kinds of goodies at a storefront that looked just like a roadside farmers stand. Im not sure how that would play in a ritzy neighborhood, but they have Trader Joes so they dont need it. The people living in the McGovern Park neighborhood, where there are no grocery stores for miles in every direction, did. Our visit was all My Darling Bs idea. Shes the familys gardening geek and food expert and has wanted to visit Growing Power ever since she read about it, probably in one of the forty-two million books about food that fill her book shelf and are piled on the floor beside her bed. She had several days off from work this week while Sean is here to visit, and while she was planning fun-filled events for each day she scheduled a trip to Milwaukee to see the Growing Power farm, because what else would you do on a Wednesday afternoon? I dont read too many books about food. Every once in a while B will recommend one to me when she thinks it’s especially good or important. Shes usually right and I end up enjoying it quite a bit, but its not typically the sort of thing I gravitate towards. Likewise, visiting a farm, urban or rural, would not have occurred to me as a grand day out, but Im willing to try almost anything once, particularly if its something that makes B happy. Growing Power is on the site of what was once a farm before the city grew up around it. Its even still zoned agricultural, which is why they can raise chickens and fish there. I wasnt sure what to make of it at first. Quite a lot of the farming that’s done there centers around an aquaponics system they built up in a greenhouse that mightve been devoted to growing flowers at one time. If it was, any sign of the FTD man is long gone and the greenhouse has taken on the somewhat tired look of a well-used farm. All the flowers are gone and the shelves have been lined with heavy black plastic to contain rivers of water gushing back and forth. The water comes from six-foot-deep tanks, mostly buried in the ground, filled with thousands of tilapia. The water from the tank, along with all the fish poop they make, is pumped up to the plastic-lined shelves. Each shelf is filled with pea gravel, which traps the fish poop, and watercress grows in it like weeds. To take complete advantage of the fish-poop fertilizer they set pots planted with borage, lettuce and other leafy greens on the shelves. The water drains into the fish tanks, the fish poop in it again, and the cycle starts over. I was very impressed by the way theyd put all this together, partly because theyd managed to keep it all so simple, partly because I get a great big gadget geek-out for stuff like this. The fish tanks are trenches in the floor of the greenhouse, lined with timber and made waterproof with the kind of thick black plastic you find in decorative outdoor fish ponds. The shelves are timber-framed and lined with the same plastic. They use an ordinary swimming pool heater to keep the fish tank warm, because tilapia are a tropical fish. 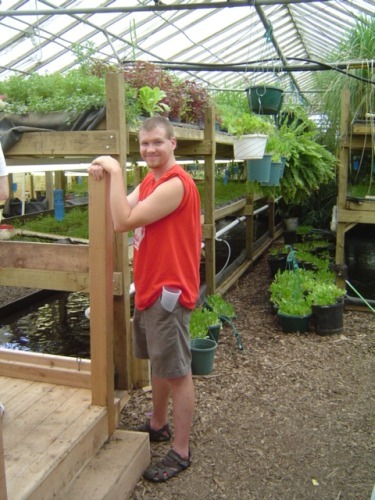 The warm water keeps the greenhouse warm and makes it possible for them to grow leafy greens through the winter. And none of this is made of special or unusual materials: all the timber, plastic, plumbing and other hardware is ordinary stuff you can buy at your local do-it-yourself store. They raise yellow perch with this system as well as tilapia and sell both at local markets and to local restaurants. The greens are harvested several times a week in the summer, a bit less often in the winter, and are also distributed locally. As impressive as the aquaponics operation is, they also raise sprouts, tomatoes, mushrooms and other veggies in hoop houses to the rear of the two-acre site. There was an apiary in the far corner out back to produce honey, and pens behind the barn where they raised goats, turkeys and chickens. Amazingly, Mike, our guide for the day, told us this one urban farm produced enough food year-round to support thousands of people. I cant vouch for the numbers but, seeing how hard they were all working at it, I can easily believe it happening. One of the guiding principles behind the operation, as Mike explained it to us, was sustainability, which they measured as farming without doing any harm to the next generation. They farmed intensely, but they made every attempt to balance what they took away with what they put back in. One whole greenhouse was filled with worm boxes, for instance, where they raised red wigglers by the ton. The worms were thrown together with kitchen waste and wood chips to make compost, and the compost was mixed with coconut husks to make plant bedding that was richly productive. Wormcast was also soaked in water to make worm tea, liquid fertilizer fed to potted plants. 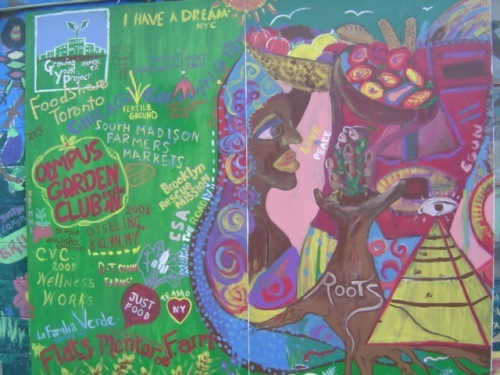 The Milwaukee urban farm is just one location for the growing organization behind it. An urban farm, called The Resilience Research Center, was christened this spring at a site on the south side of Madison, not too far from Our Humble OBode. The organizers have huge aspirations to develop it into a campus where people can learn how to develop urban farming in other cities. The tour through the Milwaukee farm lasted just an hour and a half, and although we would have liked to see much more its a small farm and theyre awfully busy. Also, it was ninety degrees when we were standing outdoors in the sun, and who knows how hot when we were gathered around a fish pond in the greenhouse, so although we would have been happy to keep on poking into every corner of the farm, asking questions, we were almost just as happy to retreat to our car and crank up the air conditioning full blast.